As her visions intensify, Jessica visits an abandoned clinic, where she stumbles on a new lead. Jeri faces an ultimatum after her secret gets out. 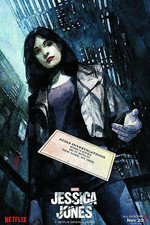 *Den of Geek - Jessica needs her sidekicks in this surprising episode of Jessica Jones. *Hogarth's partners (Chao & Benowitz) have learned of the Bad News, and say she has to accept a buyout or be forced out based on the medical disclosure clause in their contracts. Foggy makes a cameo to deliver the buyout papers, and tries to offer help & sympathy, but she shuts him down. Hogarth goes to Jessica, tears up Cheng's suit, and reveals that she has been diagnosed with ALS, and asks for Jessica's help in digging up dirt on the Chao & Benowitz to use as leverage to stay a partner, as her work is the only thing she has in life. *Jessica disposes of Simpson's body by hurling it out to sea, not wanting to complicate her probation by being found at another murder scene, and Trish keeps Simpson's bag of guns. Later, Jessica tries some hypnotherapy with a Dr. Tibolt, which doesn't do anything in the moment, but after spending the evening in her office reviewing the IGH files and making a new wall-of-case-pictures board, she dreams of being on an IV, a rain of ashes, and being grabbed by the meat-faced man when she goes to open a door. *Malcolm shows Jessica an eviction notice; the landlord is enforcing the building's residential-only zoning, but Jessica is sure Oscar is to blame. Malcolm finds Oscar has a criminal record, and Jessica sends Malcolm to the landlord (Eugene) to find out what hold Oscar has on him to have gotten the job. *Jessica goes back to the IGH lab to look at the flashback door, and finds the name Dr. Leslie Hansen, and tracks down a home address for her. She and Trish find the apartment emptied out, but in the basement storage unit discover a human skull in the furnace. Jessica sneaks the skull into the morgue and uses the login/password of Trish's snitch, Maury Tuttlebaum, to enter a case number so he'll ID it and give Trish the info for another gourmet dinner bribe. *Malcolm asks Eugene to reverse the eviction, but he refuses, and, assuming Jessica was attempting to pimp out Malcolm/honeypot Eugene, points out the portrait of his soon-to-arrive Cambodian boyfriend. Jessica clogs her toilet to get Oscar into her apartment, steals his keys to search his place, and finds photos of the Cambodian boyfriend. She confronts Oscar with having forged a Green Card ID for him, but he refuses to be intimidated. *Griffin argues with Trish about putting herself in danger, but admits that he did the same thing to his previous girlfriend who left him rather than continue waiting for him to be out of danger. (And admits to having maligned said ex by telling Trish she was "unstable".) Later, as Trish looks through her TrishTalk blog for more leads like the Whizzer's, he surprises her with groceries, but then sneaks a thumb drive into her laptop when she leaves the room. *On the air, Trish plugs a fake upcoming segment on 'medical heroes' and asks former patients or colleagues of Dr. Hansen to contribute, and gets a call from Hansen herself asking to meet alone. Jessica objects, and sends a 'Griffin and Trish are on the outs' message to TMZ to hem Trish in her building with paparazzi while she goes to the meeting instead. At the bar, Jessica confronts Hansen with having siphoned Metro-General ER patients to IGH, but Hansen insists it was all for good cause. *Meanwhile, Trish gets the call from Maury that the skull has been ID'd as Dr. Hansen's. With Malcolm's help diverting all (but one) of the paparazzi, they race off to the bar just as super-powered Fake-Hansen leaps away after bar-fighting with Jessica, and the lone paparazzo gets her on camera. I thought this was an improvement on the first two episodes - it's the first one that really made me want to keep going to see what happens next, and there was a little more investigative work. Very curious to see if Hogarth will get siphoned to IGH at some point. She has proven she'll do anything to further her own interests, what wouldn't she do for a shot at super-powers that would cure her ALS? "Jessica disposes of Simpson's body by hurling it out to sea..."
Hogarth will *so* want to get herself to IGH. Hogarth was mean to Foggy and therefore deserves every bad thing she gets. That's like kicking a puppy! I had forgotten how many bad & shady choices she had made in season 1 -- maybe because I made the mistake of watching Iron Fist where her character was one of the few bright spots. I guess this explains why she was so interested in those Kilgrave stem cells. I'm pretty sure Hogarth would take the buyout before she'd let some young dude--a little boy--try to swoop in and save her. Hell no she's not gonna let Foggy stand there and pity her like that. I think one of main things I live about this serious is when Jessica does sneaky, ethically dubious Detective work. That's really her main skill, and super-strength is just a bonus. *Jessica being a smart detective. *Jessica being stupid about relationships. *Hogarth hitting Jessica in her major weak spot. Also, have you noticed that Jessica's expressions are out of sync with her dialog? She'll give out tough Sam Spade lines, while looking like she's about to cry. Tor.com recap for episodes 2 and 3.